A few shows on The CW have begun tweeting out a confirmation that the network's Apple TV app will arrive sometime "next week," along with apps on Roku, Chromecast, Xbox, and Amazon Fire TV (via iDigitalTimes). The hint of an incoming Apple TV app was discovered last week, but an official Apple TV app for The CW -- and not just the clip-based "Seed" platform -- has been in the works for over three years. The Apple TV app will also support AirPlay. 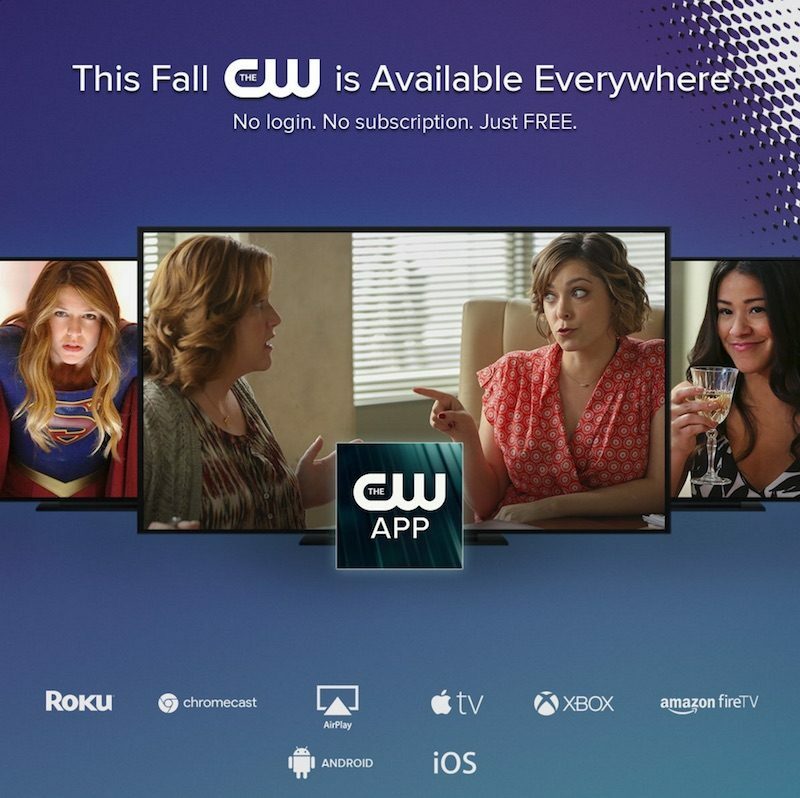 "Every show on The CW" will be available to watch on the app, which will also be free and require no login or cable subscription to access its content. Previously, The CW shows premiered on Hulu the day after they aired, but a new deal with Netflix will have entire seasons available to stream a few days after season finales air. That still left viewers without a cable subscription, who prefer to keep up with a show weekly, out to dry. The new app should help alleviate that problem, since all of its biggest shows will be available to watch, including Supergirl, The Flash, Jane The Virgin, Arrow, Crazy Ex-Girlfriend, iZombie, Supernatural, DC's Legends of Tomorrow, The 100 and The Originals. Catching up on previous seasons won't be the focus of The CW's app, however, as it appears only the "latest episodes" will be showcased. Users interested can opt in to be notified when the Apple TV app becomes available to download through a form on The CW's website. As the distribution contracts between studios and closed networks expire, we will see more and more of this happening. As a fan of the flash and arrow, this is welcome and overdue. Well slap my a$$ and call me Charlie! I never thought I would see the day that an OTA network would actually do this! As a fan of The Flash and Arrow (and soon to be Supergirl) this is VERY welcomed news. As is the Netflix deal, too. Thanks for stepping up to the plate, CW! As for ads, I can always mute commercials like I do with live sports. Awesome news for cable cutters. Let's hope the better networks follow CW. Now see this is why networks are reluctant to do stuff like this. We complain that the networks only support cable subscription apps. One finally gives us without that, and we still complain. I doubt that this is a reason for their reluctance. But anyway, why not do both and give us a choice? I guess most people are happy with free access, but personally I hate TV commercials with a vengeance and am happy to pay a bit more to get rid of them (e.g. I'm using the Hulu ad-free tier). "The Apple TV app will also support AirPlay." You could airplay it from you Apple TV to your uh... other Apple TV... Or Mac? Yeah, no idea. But hey, this seems to me like the obvious next step for broadcast TV. Throw the shows on an app, show me the same ads, and heck, I'd probably watch. Even if the app just mirrors the live streaming of their actual broadcast, I might still take it. "As long as it ain't too intrusive"? I'd being very interested in a further explanation of your economic theories. But yeah, I was vague. I do agree that content has to be paid for 'somehow'. So I'm ok, with ads, up to a point. I wouldn't want to be peppered with ads ever 5 minutes, for example. I don't pretend to have the answer here. I just know what I don't want. I used Hulu last year, but it still had ads even with a paid service. I would have been ok with the amount of ads for a free service. What's worse the highest tier, with 'no ads', still had some on popular show, so what was the point of that tier? Just food for (some other person's) thoughts! I think this should be front page news. This is what many people were waiting for, cable-free content. It probably won't be ad-free, but who knows, maybe there will be an ad-free premium version in the future for. This is a great move and hopefully more networks follow. Right now the authentication thing kills the Apple TV experience even when you have login credentials. Some days when I'm watching shows on the History Channel App it forces me to "re-authenticate" between episodes. Similar terrible experience with the ESPN app asking me to re-authenticate twice per day to the point where I just stopped using it altogether and just did airplay from my iPad. I'm guessing that it's more then just a tvOS app but also an app for your iPhone/iPad like pretty much all the other channel apps. Probably supports Airplay so you can stream it to your second or third generation Apple TV from iPhone/iPad if you don't have the latest model.